As the weekly temperature swings of 10 to 15 degrees continue, the garden plants continued to be confused. The end of the mustard greens came in late April with the final few plants bolting and flowering. The Swiss chard is still doing well as it is planted in areas that get shade. The second planting of parsley is doing well and the cilantro is hanging in there, but it will not last long if the temperatures move into the 90's in May. The spring planting of leaf lettuce was harvested in April. A few romaine plants are still going in a partially shaded area, so we will see how long they can hang in there as the temperature rises in May. The heirloom tomatoes and pumpkins began to ripen in April, with a few tomatoes harvested already. May will be tomato month, when I expect all my tomatoes will ripen and need to be harvested. The bell and chili peppers like the warmer temperatures and have been busy producing. The snow peas finally succumbed to the higher temperatures and the last harvest was done in the last week of April before I removed the plants. The grape vine went crazy in April after it's yearly pruning and has many grape bunches in process. The first cabbage from the March planting was harvested and I still have several plants that are growing, but not ready just yet. The cauliflower planted for spring is doing pretty well, though a bit of a battle ensued with the aphids, I am finally seeing the heads starting on a few plants, so hope that these will mature in May. The broccoli plants were pulled a couple weeks ago and I will plant cantaloupe in that area for the summer. The watermelon plants are coming along and the turnips are ready for harvesting. My first zucchini of the season was harvested on April 21st, but as I was leaving town for a week, it was given to my neighbor who takes care of the garden while I am away. 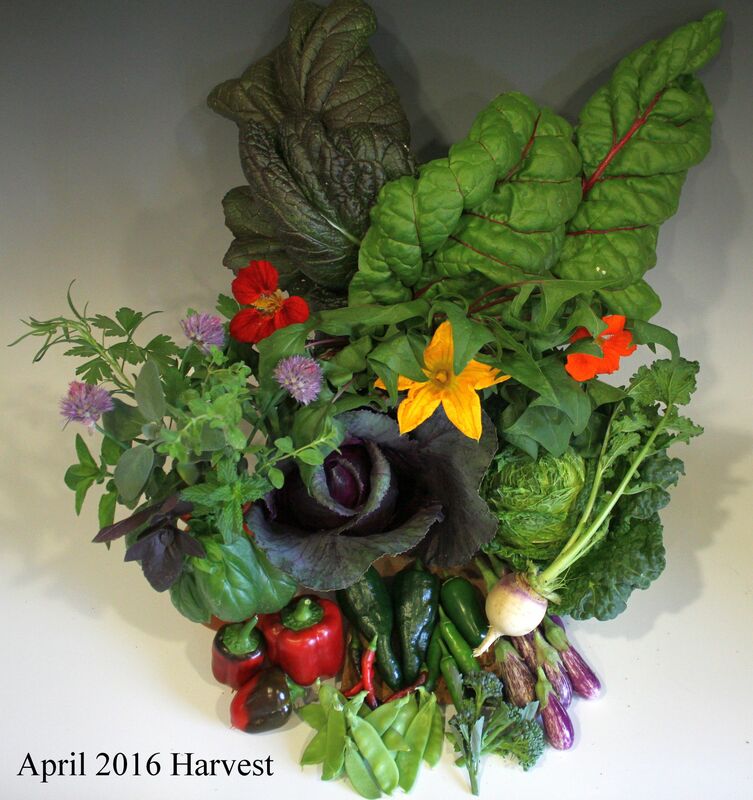 April Harvest picture - mustard greens, spinach, purple & green cabbage, red bell peppers, turnip, fairy tale eggplant, broccoli florets, ancho, jalapeno, serrano & cayenne peppers, snow peas, chive, squash & nasturtium flowers, parsley, tarragon, basil, mint, sage, marjoram, oregano. Planting guide updates include - No new updates to the planting guide this month. Finally some much needed rain in April! The tomatoes and pumpkins began to ripen. The herbs are doing well and the process of harvesting, drying and bagging has begun. The bell peppers started turning red and were harvested and the chili pepper plants are producing lots of peppers. The snow peas, broccoli, kale and leaf lettuce plants finished up for the season. Control of the aphids was needed for the spring cauliflower plants. Cleaning Garden Soil - If you have an area of your garden that will not be planted for the summer, then you may want to consider solarizing the soil to clean it up and get it prepared for the next season. You can do this by simply tilling in a bit of compost, then wet down the soil and then cover the area with plastic. Leave the plastic on for 4 - 6 weeks. This will leave you with a pest and weed free planting area. Ground up broccoli added to the soil will get rid of verticillium wilt disease, which tends to be in areas where tomatoes and vincas have been grown. Pest Control - When setting out to control the unwanted pests, you want to make sure you do not kill off the beneficial 's. To kill the bad bugs only, use BioNeem. It will kill fungus, aphids and whiteflies, but will not hurt your lady bugs, praying mantis and lace wings. You can use this as a spray according to the directions on the product. Alternate the pest control tactics/products you use so the bugs do not build up resistance to any one of them. 2. Water deciduous fruit trees on 7 to 10 day deep-water cycle for the summer. Resulting fruit will be larger. 3. Check your watering system and frequency as the temperatures begin to rise. 1. Citrus, Lawns, potted plants and annuals. 1. Do not prune citrus except to remove dead or damaged wood and branches obstructing pathways, views, or structures. 2. Don't use spray watering systems in the hottest months in the desert. Drip is better and won't cause leaves, flowers, or vegetables to burn. 3. Don't water the grass during the hotter part of the day. Just get an organic sweet potato from the store and let it start sprouting. This is a very easy vegetable to grow and it does great in the summer heat. • Flowers: Begonias, Celosia, Cosmos, Hollyhock, Marigold, Mirabilis, Portulaca, Sunflower, Vinca, Zinnia. - Tabbouleh - This is very seasonal with tomatoes, parsley, mint and green onions all readily available in the garden this month. Mulch conserves moisture, increases water percolation and moderates soil temperature. It is a layer of insulation and if organic, will also supply nutrients to the soil as it decomposes. It decreases competition from weeds and increases micro biotic activity at root systems, which helps your plants to resist disease, keeps the soil cooler to help the plants heat resistance during the hottest months. Mulch should be applied to the top of the soil in a 2 - 4 inch layer. A few recommended types of mulch are: Alfalfa hay, Bark (I use shredded coconut bark), Compost, Eucalyptus or cedar bark chips. If using bark chips, larger is better as these will not compact and will allow proper oxygen flow to the soil. Other mulch material that you may have around the house are grass clippings mixed with leaves, pine needles (5 - 8 inches deep), shredded tree trimmings (4 - 6 inches deep).